The 35th Infantry Regiment Association salutes our fallen brother, SGT Curtis Russell Frantz, who died in the service of his country on November 21st, 1969 in Pleiku Province, Vietnam. The cause of death was listed as Misadventure (Accident in Mortar Pit). At the time of his death Curtis was 21 years of age. He was from Palmyra, Pennsylvania. Curtis is honored on the Vietnam Veterans Memorial at Panel 16W, Line 105. The decorations earned by SGT Curtis Russell Frantz include: the Combat Infantryman Badge, the Bronze Star, the National Defense Service Medal, the Vietnam Service Medal, the Vietnam Campaign Medal and the Vietnam Cross of Gallantry with Palm Unit Citation. Recently I learned of the very inspiring letter written to you by your son, Staff Sergeant Curtis Frantz, shortly before his death in Vietnam. His devotion to duty and love of country are evident throughout his letter, as I am certain they were evident throughout his life. The death of this fine young man has caused you grief, but his life has given you and the others who knew him, either personally or through reading his letter in the Lebanon Daily News, cause for pride. He was inspired by love of country, and now his words and his sacrifice will inspire many others as we work to bring peace to the world. As a parent, I know that many years of sacrifice and love go into the raising of a child. I want you to know that the sacrifices you made were not made in vain, for you brought to manhood one in whom the virtues of patriotism, courage, and love combined to make a good soldier and a proud American. You have my deepest condolences on the grievous loss of your son, but also my sincere thanks, as President and as a fellow American, for the kind of young man he was. Curtis R Frantz isnt coming home. 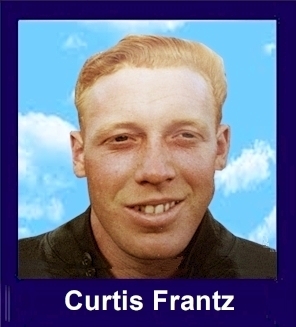 SSG Frantz is one of many American servicemen who have died in the Vietnam War. Frantz, only son of Mr. and Mrs. Russell R Frantz, 328 W Pine St., Palmyra, died for an ideal in which he strongly believed. His parents feel grief, but they are not bitter. Shortly before he was killed in action November 21, Frantz wrote a testimonial that he sent to his parents with an American flag that he had carried and treasured during his tour of duty. These articles have not replaced the family's loss, but they have apparently helped solace them in their grief. "Now that he gave his life for his country, we thought maybe it would help others to read it. It might make them think a little. He wrote the letter just before the November 15 Moratorium," his mother said, "and he said, If anyone wants to know how I feel, give them this to read. "He loved his country. He believed with all his heart in what he was doing, and he often said so. He said many wonderful things in his letters, but he never wanted us to worry." The 21-year old soldier had served a year and two days in Vietnam, mostly in the field, and had extended his tour of duty for 30 days. He was killed on the day he probably would have left to return to the states had he not extended. He was scheduled to arrive home December 23 and was slated to light the Christmas candles at Bethany United Methodist Church, Palmyra, on Christmas Eve. As for the Moratorium, the way I look at it is that I am over here fighting for freedom, and that includes the freedom of speech and public assembly. The majority of the people that participate want peace and to put an end to the war. The thing is, if we are pulled out of Vietnam, there wont be peace, at least not in this area of the world. The Communists will come down from the North and turn South Vietnam into a blood bath. The more we give in, the more area would fall under Communist control; we have to check their expansion somewhere. Id sooner do it here than on the shores of the United States. I dont believe in killing, yet I have taken the lives of at least four NVA soldiers. I don't believe in war, yet I support the President and his policies. One of my buddies died in my arms in January, so I also owe him something, to make sure he didn't die in vain. The decisions made in the future will tell us whether or not 40,000 Americans died in vain. Out of all the people that protest, how many have fought over here and understand this war? Understand whats it like to live for a year in fear of death, seeing a friend killed, to see a burned village, or a child that was orphaned because her parents were executed by the NVA, to go without a bath, shave and clean cloths for weeks on end, to walk five miles over mountains with a 60-pound pack on your back, to lie in a foxhole during a mortar barrage and wonder if one of the shells has your name on it, to live on two glasses of water a day because you cant get resupplied and the streams are dried up, to see a Medivac helicopter loaded with wounded shot down and all on board killed. I am not telling war stories, just some of my personal experiences. If you have not fought over here, do not protest against it. There is more to this war than meets the eye. I have not seen home for a year. I want to come home so bad, yet if giving my life would preserve freedom a little longer,I would not hesitate to make that sacrifice. Sure the White House makes mistakes,but right or wrong,it is our country. If it is wrong,lets make it right. But if nothing else, at least stand by her in time of need. The Good Lord and the United States gave us a lot to be thankful for. Lets see to it that our children get the same opportunities we did. "Ask not what your country can do for you;ask what you can do for your country." I am not putting myself in the trust of signs, slogans, or marches, but in the trust of God and the hope that He will guide our leaders and aid them in making the right decisions. Nixon is doing more in trying to bring the GIs home than LBJ ever did. But nobody realizes that North Vietnam is happy about the Moratorium,and they are openly urging us to support it. And why shouldn't they? There is nothing like dissent to ruin a country. "A house divided cannot stand." We could beat the NVA, and do a lot more to stop aggression, if we had the support of the people back home. People used to be proud of its men in uniform. Now the trend is to regard them with distaste. I'm proud that I served, but when I come home, I will get the weird looks, etc., because I am a veteran, not because I shirked my duty. No wonder the GIs morale over here is zero. I fought to protect all the people back home that think freedom is a right. But freedom is not a right, it is a privilege, paid for in blood by millions of Americans ever since 1776 and we must fight to keep that right of being a free country. "For those who fought for it, freedom has a taste the protected will never know." I had better quit now; I have said enough. But let me end my oratory on a question directed to the American people in general. I have earned my birthright and the right to call myself free and an American, have you? The Bronze Star Medal is Presented Posthumously to Sergeant Curtis R Frantz. For distinguishing himself by outstanding meritorious service in connection with ground operations against a hostile force in the Republic of Vietnam. Through his untiring efforts and professional ability, Sergeant Frantz consistently obtained outstanding results. He was quick to grasp the implications of new problems with which he faced as a result of the ever-changing situations inherent in a counterinsurgency operation and to find ways and means to solve those problems. The energetic application of his extensive knowledge has materially contributed to the efforts of the United States mission to the Republic of Vietnam to assist that country in ridding itself of the communist threat to its freedom. Sergeant Frantzs initiative, zeal, sound judgment, and devotion to duty have been in the highest traditions of the military service and reflect great credit upon himself, his unit, and the United States Army.